Overcast 4.1 is out with a handful of new, notable features and bug fixes. My favorite addition is what Marco Arment calls Smart Resume, which does two things. First, when resuming playback, Overcast skips back a few seconds to remind you of where you left off in a paused episode. Second, Overcast resumes playback in the dead space between words where possible. The effect is understated but perceptible. During the beta of 4.1, I had a sense that something more than simple skipping back was going on with Smart Resume, but I couldn’t put my finger on it until I dug into Arment’s release notes. Smart Resume reminds me of what happens when an in-person conversation is interrupted. If you’re sitting at a table in a restaurant with a friend and the waiter interrupts one of you mid-sentence, you don’t pick up where you left off mid-word. You back up and start over. Smart Resume is similar. I hadn’t realized it, but when resuming a podcast, I’d gotten into the habit of skipping back 30 seconds when I lost track of where I was in an episode. That was more time than necessary to recall where I had left off, but it worked. With Smart Resume, I’ve found I rarely do that anymore. Instead of the extra fiddling with the app’s buttons, Overcast skips back just far enough to jog my memory but not so far that I feel like I’m re-listening to too much of an episode. Moreover, dropping the seek point in between words makes the feature feel natural. Smart Resume can be turned off in Settings, but I wouldn’t recommend doing so. Overcast 4.1 also adds a new auto-deletion setting. 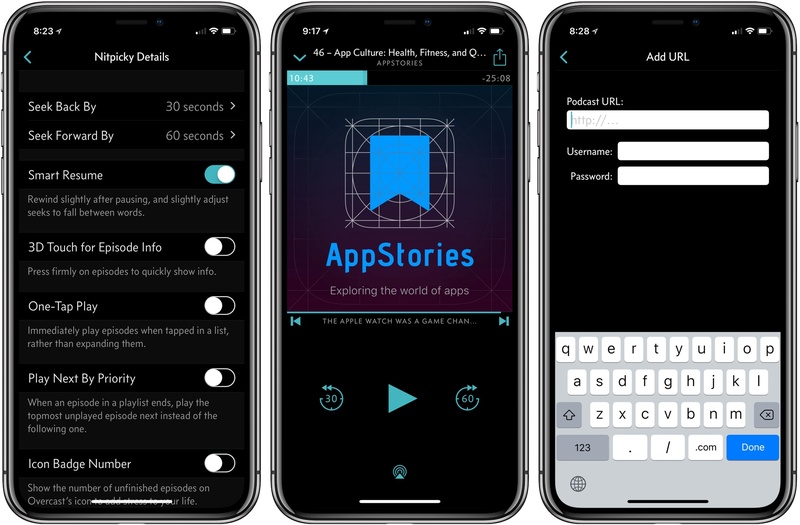 Previously, you could choose between auto-deleting episodes immediately after finishing them or leave them on your iOS device for manual deletion. Overcast now has a third choice, which is automatic deletion after 24 hours. Premium members’ uploads to Overcast are no longer subject to auto-deletion either. Password-protected podcasts are now officially supported in Overcast too. In the Add URL screen, there is an option to ‘Use Password,’ which reveals username and password fields when tapped. Podcasts that require a password do not show up in Overcast’s search results or show recommendations. Smart Resume is an excellent example of what I like most about Overcast. The feature highlights the app’s overall attention to detail when it comes to the listening experience, which makes it a pleasure to use.